The ThINKin' Spot: October Kit Cat...Woohoo!! Hello, and welcome to October Kit Cat Sunday! This was my month to host the Kit Cat Challenge Club! Boy, did I ever have fun shopping and planning the kit for this! I've always wanted to do an altered frame, but had never tried it until now. I managed to challenge myself, and I hope the rest of the Cats were challenged too! 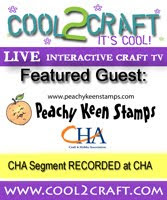 I sent out kits which included a wooden frame, assorted DP, stamped images from Peachy Keen Stamps, a glue stick, a nail file (yep! ), and a few assorted embellishments that the girls could choose to use, or not. The sky is the limit with our projects, as long as the main subject, or theme is followed through. I've seen one other Kit Cat Creation today, done by Jeanette and I see that Michelle has hers uploaded now. Be sure to check out the links below to all of the awesome Kit Cat projects. What a wonderful treat!!! I chose this great striped paper from Bo Bunny, and I used lots of Tim Holtz distressing ink in Vintage Photo for the edges, and I actually used it as stain on the back of the wooden frame. The images were all colored with my SU inks and aquapainter. I made some grass to sit the jack-0' lantern on, found an old button in my stash for the star, and finished off with this great SU ribbon of which I frayed the edges. The BOO... and EEK! are glitter stickers. All in all, this was really a very simple project that did indeed make me think outside of the box. What a great gift this would make for someone special!! I really do have Halloween photos to use, but they weren't handy, and this little picture of Tanner and Gracee fit perfectly. Good heavens!! Is he cheesing it up, or what? They are so funny. That is actually a picture of them modeling the duds they wore for Tyler's wedding. They were so cute!!! Thank you so much for stopping by today! It's a beautiful Fall day outside, and I hope your day is beautiful too! Enjoy, and happy stampin'! OMGosh! I am so stealing the Tim Holtz ink idea. Seriously! I love seeing what everyone has done. Thanks for challenging us to think, as you say, outside the box. This is the best project ever and I never would have thought to try a frame without you! I absolutely love yours and the pom pom - to die for! Oh Lorie - my stars, girl, you can make coloring images look like a Van Gogh, girl! Your coloring is just out of this world phenom. This is such a sweet, sweet frame! And look at those lil cuties in the picture!!! I love the striking background and the cute little images all around ~ thanks so much for a wonderful kit this month, you really went above and beyond and made us stretch our imagination and creativity! Thanks, sweets!! Lorie, your frame is so so cute! I love it!!! (Why am I not surprised? I always love your creations!) Your coloring is gorgeous! I love love love the grass and frayed ribbon! What a great idea to add words (why didn't I think of that?) Everything about your frame is so fun!!! oh lori! you are just a body full of talent! this is fabulous. that striped paper is awesome and those kids!!!! are they ever the cutest! Goodness Lorie, you never cease to knock my socks off with your incredible artistry! Your Peachy Keen stamps are the CUTEST, and this frame is just adorable in every way, including that darling picture!!! YUMMO! This is just fabulous, Lori! You totally rocked your first attempt at an altered frame and I love the stamps, papers, and ribbons you chose. Feel free to shop for me anytime! heehee. Lorie, you are amazing! Seriously, you ooze sooo much talent!! This frame is perfectly done and I love all the little details in it. You and the girls did some amazing things with the kit you supplied this month Lorie! It's so fun to see what everyone did with it! WOW! this frame is adorable! This would be a great gift for Christmas!! This is SOOOO SOOOO Adorable!! I love it and those stamps are perfect for this project! Wow! Cute cute! Your kit looked fabulously fun to play with and what you did with yours is nothing short of WOWZA! The coloring on the Candy Corns is amazing...well everything is amazing actually. All the girls have done a fabulous job. Lorie! Wow! Love the distress effects on your DP, and of course you know that your coloring makes me drool! Love how you "grounded" the jack-o-lantern, and love the button and frayed ribbon accents! Mah-velous job, my friend! This is one fabulous frame! I love the colors you chose & of course, as always, admire your coloring skills! There is one word to describe this. Okay I lied...there are several! Gorgeous, stunning, a masterpiece..and I could go on and on! I need you to come and teach me!